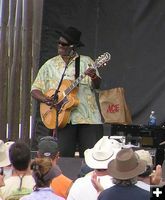 The 2005 Pinedale Blues Festival was held over the weekend of August 20-21, headlined Sunday night by Buddy Guy and Taj Mahal. 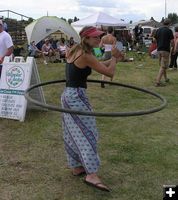 The festival drew a large crowd of people from all over the US. The weather was perfect both days. Other performers included Little Charlie & the Nightcats, Chris Duarte, Blinddog' Smokin, Eric Sardinas, Debbie Davies, Anders Osborne, Blues is Blood and Miss Blues. Our unofficial parking lot survey showed people from all over Wyoming, Montana, Utah, Idaho, Colorado, New Mexico, Illinois, Ohio, Florida, Arizona, Texas, California, New Jersey, Missouri, Minnesota and British Columbia attended the event. Onsite camping was available for the event on a first-come, first-serve basis at the rodeo/Rendezvous grounds, with a $10 clean up fee. Tickets were $35 for Saturday, $40 Sunday and $60 for a weekend pass. Children under 12 attended the event for free. 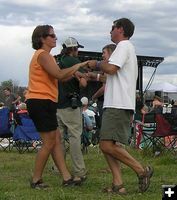 The Pinedale Blues Festival was moved from June to August this year to take advantage of the warmer summer weather for the outdoor event. 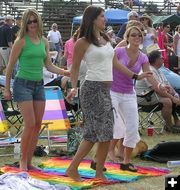 Organizers plan to hold future festivals annually the third weekend in August. The event was sponsored by Bottom’s Up Brewery, Half Moon Lake Resort and B&B Oilfield Services. 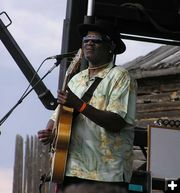 For more information about next year’s Blues Festival, call 1-888-303-5082. Photos by Dawn Ballou, Pinedale Online!